The past three-day weekend marked the unofficial “end of summer.” Kids are all back in school, college campuses are bustling, and everyone’s returning to work and sharing pictures and tales of what they did and where they went over the summer. Of course, I’d love to tell you I went on a lengthy tour of the castles and museums of Europe on a quest of discovery of the history and culture of knighthood … but for me (like many people this year) this was a summer for things a little closer to home. But, ironically, that doesn’t mean that I didn’t have a few pleasant, surprise (and completely serendipitous) encounters with the history of medieval knights. In August, I was traveling with a friend through the city of St. Louis, Missouri. We were on a quick business trip, and when I found myself with an hour to spare in the downtown area, I decided to take a stroll through the historic Forest Park, site of the 1904 World’s Fair. Sadly, since I was there on a whim, I didn’t have nearly enough time to explore the many museums, gardens and activities that are housed in the park. But I was drawn to one very prominent feature: A bronze statue of a knight on horseback, which stands in front of a very impressive building on a hilltop overlooking the park. The statue, it turns out, is a monument to the city’s namesake, St. Louis, also known as Louis IX, the famous crusader king of medieval France. 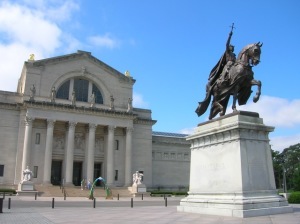 The building, it turns out, is the celebrated St. Louis Art Museum, whose motto, “Dedicated to Art and Free to All,” is carved right above the front door. Since the price was right, I decided to poke my nose in the door and ask one simple question: “Do you have any armor on display?” The docent directed me downstairs where I spent the half-hour I had to spare visiting the museum’s gallery of medieval armor — a small but respectable offering of late-medieval weaponry and knightly equipment, including a fine example of German “Maximilian” plate armor of the 16th century. The armor gallery is obviously very popular with museum visitors — there’s even a “Family Guide To Arms & Armor” brochure available at the front desk that allows kids to properly identify every piece of a knight’s harness, from sallet to sabaton. Unfortunately, this very nice gallery of the armor-maker’s craft is tucked away in a remote corner of the basement, and is accompanied by relatively rudimentary historical information. The display is just ripe for an active interpretation to help visitors understand the craft, function and symbolism of medieval armor — and since there’s a beautiful patch of lawn right there under the gaze of the St. Louis statue, all the museum needs is the right person or group to coordinate a demonstration of arms and armor in action. If you’re at all intrigued by medieval arms and armor and you’re in the St. Louis area – even for a few minutes! 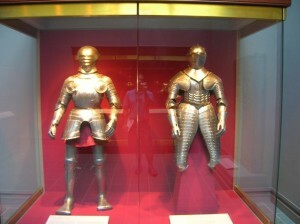 – be sure to stop by the Art Museum and visit the armor gallery (and enjoy a picnic lunch at the riverside in Forest Park). A few weeks later my wife and I decided to take a little “road trip” vacation before the start of school through the heart of California’s Gold Rush country. We spent several days driving along the back roads along both sides of the Sierra-Nevada mountain range, haunting the mining towns that the freeway system has bypassed. There are a lot of intriguing landmarks and historic monuments in this area, but when we got to the Calaveras County Historical Society & Museum (in the town made famous for the frog-jumping contest in Mark Twain’s short story) we were surprised to see a shirt of chain mail hanging in a display case at the back of the town museum. Medieval armor is not the sort of thing you expect to see in a quiet three-room museum upstairs from the Hall of Records (and town bookshop) in California’s prospecting country. The story of the shirt of mail was displayed on a placard beneath the case: Apparently it was owned by the notorious outlaw George Washington Cox, who was arrested in Calaveras County and sentenced in the county courthouse (which is now part of the museum). 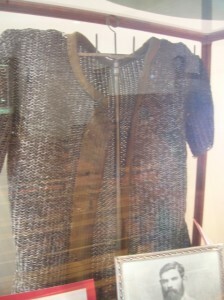 The display said “armored protectors” like the one worn by Cox were not uncommon among men who spent time on the Western frontier, since the chain mail, worn underneath a shirt or coat, was essentially proof against arrows, tomahawks, Bowie knives and just about any other sort of weapon short of a sixgun. According to the museum, there was a relatively lucrative business being done in San Francisco crafting these shirts of mail for scouts, miners, homesteaders and anyone else heading out to the dangerous reaches of the Wild West. It seems particularly ironic that the cowboys and gunslingers, sometimes called “knights of the Old West,” might, in fact, have been a little closer to their medieval counterparts in their equipment than anyone previously thought. Of course, neither of these chance encounters with knightly arms and armor has anything to do with the principles of chivalry other than to serve as a reminder that references, artifacts and images of medieval culture sometimes pop up in the most unexpected of places. The more we study and understand the world of history — whether it’s armor and castles, or chivalry and the tales of the Round Table — the more we are prepared to understand the world we live in today.